The first batch of 2010 World Championship DVDs are shipping from the Drum Corps International World Headquarters in Indianapolis this week. Fans of drum corps who've ordered the Volume II DVD (13-23 placing corps) may, however, be in for an unexpected and somewhat unpleasant surprise when they get to track three, showcasing the Troopers' season-culminating Semifinals performance. Two audio segments of the Troop's 2010 "Wanted" show, each lasting about 15 seconds, have been removed from the video recording. Although the visual performance and drill formations will be shown on the video in their entirety, the music for that portion of the performance has been silenced in the editing process. This was due to the inability to secure the necessary approvals for including it on the DVD even though all other required licensing applications were approved. Over the past decade, ongoing changes in the music industry and a variety of new distribution channels for copyrighted works have brought licensing issues – and their related expenses – to the forefront for Drum Corps International and its member corps. Seemingly long-gone are the days when a corps can merely choose a popular piece of music, have it arranged to suit its needs, and perform it at will. The investment of money and other resources to remain in compliance with music licensing laws is an increasingly large portion of the budgets for both DCI and the corps every year. 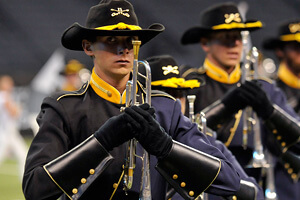 Licensing requirements are far-reaching In an ongoing effort to stay 100 percent compliant with a multitude of comprehensive music licensing laws and regulations, the 2010 Troopers' performance is one of a handful of post-season edits that have been made to DCI World Championship DVDs over the years. Fans may remember similar compliance issues with small portions of last year's Troopers performance as well as the 2008 Phantom Regiment. "As we continue to expand the reach of Drum Corps International and its member organizations, it is our responsibility to ensure that we are compliant with copyright law and that we are working to protect the rights of those who own the copyrights to the music being performed," said DCI Executive Director Dan Acheson in a 2008 DCI.org article. In 2010 alone, Drum Corps International and its member corps paid licensing fees in excess of a quarter-million dollars to publishers and copyright holders of performed works. Aggregate expenditures for licensing and related concerns could exceed that amount in 2011. Read more about what it takes for Drum Corps International to stay compliant with music licensing laws. Striving to preserve historical record In the instance of the 2010 Troopers, the appropriate licenses to arrange and perform were obtained prior to the start of the season, allowing the corps to take its entire production on the road to some 30 live events across the country. Not until after the season was concluded was it discovered that a synchronization license, which allows a musical segment to be included along with a fixed visual recording (in this instance on a DVD), could not be obtained from the music publisher. When this happens, it becomes a last-resort judgment call on the part of the corps whether to attempt to seamlessly cut the unlicensed segment out of the DVD, or to include the visual components without the audio. "We try to preserve as much of the performance as possible. Personally, I prefer to avoid the option of showing marching without music," said producer Tom Blair. "In the case of the Troopers, the visual components at the beginning and the end of the show were too important to the production's storyline to remove, so they march in silence to preserve the design and the hard work of the members." Blair says that a few other small edits were additionally made to seamlessly remove unlicensed musical phrases. "Arrangers pride themselves on the creative ways they find to weave a musical thought throughout their shows. But if that musical thought isn't licensed, it becomes an editing nightmare to remove it and maintain the continuity of the program as well as the obvious visual challenge of the excision," he said. "We are fortunate to count among our ranks some of the most talented arrangers and composers in music education and in the entertainment industry, many of whom are also creators of copyrighted works," said Acheson. "We will continue to be diligent in our commitment to understanding our responsibilities and to educating our members as to the need for compliance in this important area of our operations."